Nearly put myself on Andrea's most wanted list yesterday. Have been looking at prices of maxxed TH12s/11s. Saw this base for $60 and it seemed reasonable as most max TH12s run for around $300. Was about to buy and then noticed the loot/gems. Also... how has kk managed to get worse? She seems to have a weird attack where she drops a few valks and all her wizards. Once they've died a pointless death she sends in a wrecker plus 14 giants to rumble around for an aimless 2 star against weak bases. We're safe from relegation but I suspect another bronze medal this CWL. Outgunned on 12s nearly all across the board. We are going to wait until tonight or tomorrow to declare. Hoping to weed out some of these top clans by letting them declare early. It worked for us last time. We waited almost two days to declare. Hadn't thought of that but I imagine the less organized clans declare late so we'll have to try that next CWL. Heard that a Titans league for CWL is in the works but had to translate the article from Spanish so take that with a very cautious grain of salt. Not sure we're that badly outgunned tbh TUF. Would say total th12s and th11s is more key than th12s. Gap is still pretty small, especially when heroes are rushed. We go much deeper than last time. Only 2 TH10S. Well one of our regulars was out during our conversation but decided to hop back on and declare so there goes that plan. How's it looking juice? What's the typical th12 count? We seem to be facing lots of rushed th12s with rubbish heroes. Definitely have a sniff of promotion if we keep the canliness to a minimum. If I have enough power potions, I'm hitting the TH12 button before next CWL. Vee was gifted one of the easier 2 star targets of the round and don't think he even sniffed the TH. Will have a maxxed queen by then and all the troops I regularly use will be maxxed. If you don't get any extra walls at 12, my layout will be better suited for max xbows anyways. On top of that, poor Dru seems to have chosen Vee as a role model and has done the same. This wars over. Also, what's your boggle @BigDaddyDelta What can you tell Fobar on FB but can't tell your clansmen? Quit brooding and throwing out bait, and just let the healing begin mate. If it was just you guys it be fine. But lot of ranbobs i dont know that well. Plus not talking about it is my way of dealing with it. Yes but you're in danger of becoming a meme by throwing bait out there on FB and then not sharing when people ask. There are no randbobs in here. I understand if you'd rather not but stop making me worry. I love you too hard. Im fine Tuf thank you for your concern. Its just lady troubles, typical stupid ****. Let's not forget dear old mirek... after months of moderate success with e dragons he watches one dude spam miners and 3 star me and Dave and now that's his go to attack... despite failing miserably with it twice in war and multiple times in fc. Too many liabilities to get promoted. This was the key match up. Basically...we're kind of a bunch of cans, but so is everybody else. It's like this match-up; on paper the other team are stronger, but I expect to see a string of mediocre hits from them as they've done much worse against common opponents. We've still got a solid chance of promotion IMO. Should win this one assuming they don't suddenly get good. Next match is against the group's whipping boys. Final match against early favourites GoTurk. They lost to the guys that we lost to (31-27, compared to our 32-28), and are only 4 stars ahead of us. Pretty sure that we win our next 3 and we go up. @juice64011 how are things faring in SBF? 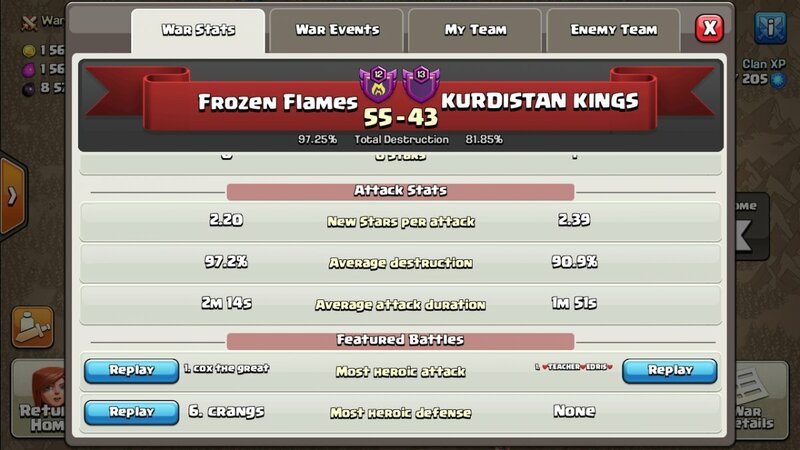 What parallel universe have i stumbled into.....Mirek and Vee knocking out 9 stars from 3 war attacks between them! Final match... and there is hope. They're not very top heavy but have a lot of really solid th11s. @TUF; apologies but this is another yolo war for you. You're hands down the most reliable th11 at 2 starring th12s and that has a knock on effect of at least 2 or 3 stars elsewhere. If we stick to the same approach as last time you will be rewarded with medals for your efforts. This is going to be tight but if there are no screw ups I think we have a good chance. Yeah...I'll be honest, as far as I'm concerned I'm acting leader at the moment. Marking up bases in both wars all week, dealing with cry babies throwing tantrums in the feeder and coaching Mirek back to vaguely decent attacks has been pretty full on. We sort of settled on a good approach last time I think. We hand out one award to the person who does most cc's, one or two for frequent yolo-ers, and the rest based on top ranked players. Seems fair enough I think. I get it. Just a strong possibility of a 0 star. Have a decent game plan for #2 but never seems to go that way against 12s. War troops request sent. Yeah...i think we need to gamble a bit to win. Sorry about the slow wrecker delivery. I was in a 3 hour LT meeting and Dave is on the road. Rare that neither of us is on for that long tbh. No worries. Was just hoping to get an early hit in today to avoid Dave's fall guy/scapegoat status if i come up short : ) Now that I'm stocked on power potions, gonna hit the TH12 button within the week so I'll have 4 upgraded army camps by next CWL, depending on whether we get promoted this CWL or not. Was looking at the medal awards for the different leagues and it might actually not be a bad thing if we don't get promoted. 1 extra win over the 7 days gives more trophies than I suspect we would earn being middle of the pack up in Masters 3. Oh we'll get way more medals finishing 3rd in this league than 5th or 6th in the one above. But it would feel like quite an achievement nevertheless. Still delicately poised. Vee has cracked under the pressure a bit and only got 4 stars hitting down one th but they 1 starred arrow. If you can wait on your hit we might have the luxury of a de-risk re shuffle. No worries if you just want to go ahead and hit though. Okay... we definitely need to take that gamble after the ek/vee implosion. Tuf - key is valks in cc. Enraged valks and a frozen th will take it down every time. Good luck! That was the plan. In a perfect world, they take to the jump spell and path down to the eagle after taking out the TH. Should be able to get some decent % out of queen walk assuming Ghosts theory about the right side isn't true. Buying a new phone this week for similar reasons. Work roof leaked. Looked down and phone was in a small puddle. Has been temperamental since. All of Teemu's rice couldn't save it at this point I'm afraid. I think if we play it safe from here on out, we have a decent chance but damage % isn't on our side. I look at it like we got most our liabilities out of the way. It's SpartaUK alum and River/Clan. Those are pretty solid closers with plenty of room for them to still slip up. 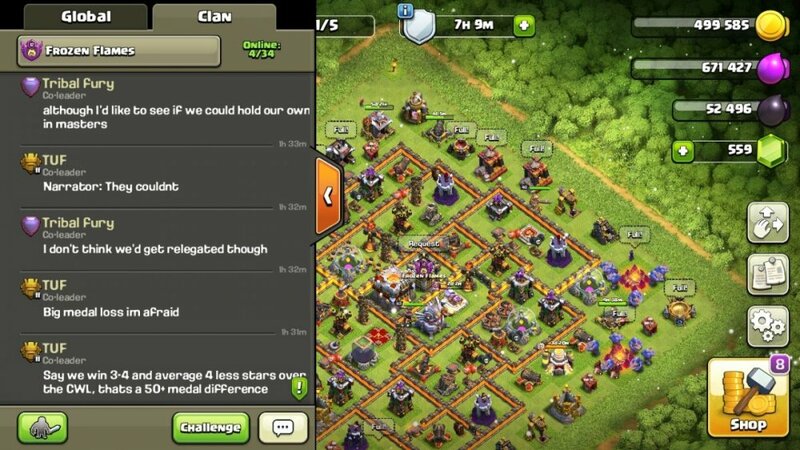 My clan tries too hard to get 3 stars against TH11s and 12s in war league. Then end up with 1 stars. Dont start an army on the complete opposite side of the TH unless you are sure you can get to it.